A mixture of 1960's rock with contemporary arrangements and lots of cool harmonies. Perfect if you're a fan of the Beatles and The Beach Boys music. 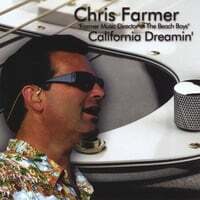 Chris Farmer, the former bass player and vocalist for The Beach Boys from 1995 to 2007, releases his first solo disc. A few years ago, Chris and some of the other support musicians of The Beach Boys went into the studio and recorded an entire set of their favorite songs from the road. For example, \"California Dreamin\'\" was a song that Chris sang lead vocals with The Beach Boys, and it became associated with him when he was on tour with the group. The tracks remained unfinished for several years. In October 2007, Chris went into the studio to finish the songs. The CD is co-produced by longtime Beach Boys sound engineer Jeff Peters. All vocals by Chris Farmer on California Dreamin’, Why Do Fools Fall in Love, I Saw Her Standing There and California Sleepwalkin’. All instruments and vocals by Chris Farmer on Don’t Worry Baby. All vocals by Jeffrey Foskett and Chris Farmer on Let’s Dance and Fun Fun Fun. Guitars - Adrian Baker, Scott Totten, Jeffrey Foskett, Randell Kirsch. This is an excellent reprentation of the Beach Boys as they are now, but without one of the original members, e.g.Mike Love, present. I have missed their shows twice recently in the UK, but this album more than compensates. Harmonies are true to originals, but together with production, just different enough to be interesting Hope they do more. I think your cd is the best of heard for a very long time . Keep up the great work.